Which Oscar Hopefuls Are the Most Vulnerable? The Oscar nominations will be announced a week from today, and though we’ve already been through so many awards precursors and critics’ groups that we could practically predict the nominees in our sleep, there are always a few scattered shocks. Still, for one surprise nominee to make it in, another presumptive nominee must fall out, and so Vulture has studied the top six Oscar categories to figure out which expected candidates are currently the most vulnerable. Who might be the recipient of a stinging snub on the morning of January 25? At one point, 127 Hours looked like an Oscar front-runner in categories like Best Picture, Best Director, and Best Actor, but now the latter nod is the only one the movie can count on. So what happened? A couple of things: The movie was perceived as a box-office disappointment (but didn’t manage to position itself as an underdog in need of support, like The Hurt Locker did last year), while James Franco’s decision to host the Oscars meant that the face of the movie wasn’t necessarily serious about winning. Still, the biggest obstacle that has plagued 127 Hours all season is that people have been too afraid to see it, turned off by the film’s notorious arm-cutting scene. If enough voters refused to watch their screeners, on-the-bubble Best Picture hopefuls The Town and Winter’s Bone could seize the advantage. Before the DGA nominations came out and the Coen brothers were snubbed, pundits weary of The Social Network’s dominance were declaring True Grit to be an incipient awards threat. The movie could still strike a chord with Oscar voters (who’ve had more time to admire the film’s strong box office), but the Best Director category is crowded this year and the Coens won for No Country for Old Men so recently that they’re in danger of being overlooked. The candidates for Best Actor all have strong partisans — even though Colin Firth has the award locked down, passionate cases have been made for potential nominees like Ryan Gosling and Javier Bardem — but is anyone talking about Robert Duvall? The actor is at a hype disadvantage since Get Low came out ages ago, and though Duvall’s grizzly veteran actor thing will play well with older voters in the Academy, Jeff Bridges is working the same angle for the much more widely seen True Grit. If Lesley Manville had slotted herself for Best Supporting Actress, she would be seen as a front-runner for her work in Another Year. (Can you imagine the showdown between her boozy character and Melissa Leo’s brassy mom from The Fighter?) Instead, Sony decided to sell Manville as the film’s lead actress — though Ruth Sheen almost certainly has more screen time — and now she’ll be lucky just to get nominated in one of the most crowded Best Actress derbies ever. Andrew Garfield is the quiet conscience of The Social Network, and that may be important to voters who supposedly find the film too chilly. Still, he’s not a sure bet to get nominated by any means, since there are a ton of flashy performances in contention for this category (including two from his own movie, Armie Hammer and Justin Timberlake). 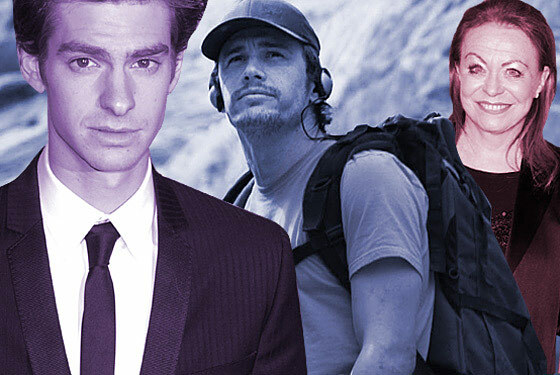 Deposed by John Hawkes from Winter’s Bone, Garfield tellingly didn’t land a SAG nod, and the Academy might decide that this promising actor is worth rewarding at a later date (or that his Spider-Man role is reward enough). Make no mistake, we are rooting for Animal Kingdom’s Jacki Weaver to land an Oscar nomination for her work as the year’s most frightening screen mom (and 2010 was full of them). We’re just a little worried. There are already four locks in the category — Hailee Steinfeld from True Grit, Amy Adams and Melissa Leo from The Fighter, and Helena Bonham Carter from The King’s Speech — and SAG voters filled the fifth slot with Black Swan’s Mila Kunis, whose movie is a huge, surging hit. (Incidentally, how did Kunis get the nod over Barbara Hershey’s full-throttle histrionics? Forget our hypothetical Manville-Leo matchup: What a treat it would have been to imagine a bad mom battle royale in this category between Weaver, Hershey, and Leo, all vying to supplant the ultimate bad mom played by last year’s winner Mo’nique.) Jacki, we’ve got our fingers crossed.